Cymatics is the study of "wave phenomena." I finally have a name for this intriguing phenomena. This is great. Naming a thing seems to give it more weight, more staying power. I can say my artwork has to do with cymatics, and people may not know what I mean, but they sure will know I'm up to something. 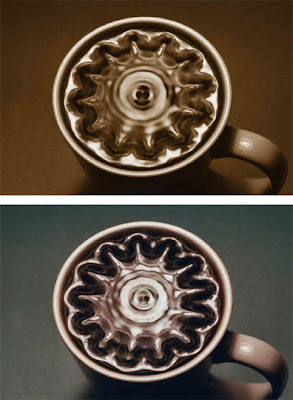 On a more serious note, here's some patterns in coffee, photographs taken by a science-photographer, Robert Anderson. These patterns were created using a 20 Hz vibration, which is the "normal mode frequency" of the coffee cup. The pattern is beautiful. I think I could reproduce these in water in various containers. It would be really interesting to actually pour the actual bronzes for Tibetan singing bowls. Water Tibetan bowls can produce many different patterns apparently. These patterns, essentially the opposite of the Chladni patterns, in that the nodes and anti-nodes are reversed. It's interesting to see how these patterns resemble architectural elements, such as the rose windows in cathedrals. Goethe famously said "Architecture is frozen music." Several artists and musicians are attempting to translate architectural structures into music. What if music is coded into the architecture, as is theorized by the at the Rosslyn Chapel? Tommy Mitchell claims to have decoded the "frozen music" in the carving and statues at Rosslyn Chapel. Each of some 213 unusually decorated cubes in the Rosslyn Chapel very closely relate to specific patterns generated by the Eidophone - the musical instrument created by Ernst Chladni to visualize the physical patterns of tones. Mitchell translated each of the patterns into the corresponding notes, and had a choir sing them. A great deal of effort has been expended to ensure the authenticity of the music, and he had it reproduced and recorded. He believes that it is much more than simply a lost sheet of music and that the actual resonances might hold the key to unlocking some wisdom that the Knights Templar locked away. Playing these resonances might actually knock a stone loose, according to Mitchell. For my project, I'm considering combining visualization/sonification of the unseen/unheard - such as EMF, infra red, and static - with symbolization and resonance of cymatics. This idea of resonances unlocking keys, moving stone, and creating comlplex maps and puzzles is really fascinating to me. Cymatics on Wikipedia: "Influences in art Jenny's book influenced Alvin Lucier and, along with Chladni, helped lead to Lucier's composition Queen of the South. Jenny's work was also followed up by Center for Advanced Visual Studies (CAVS) founder Gyorgy Kepes at MIT. His work in this area included an acoustically vibrated piece of sheet metal in which small holes had been drilled in a grid. Small flames of gas burned through these holes and thermodynamic patterns were made visible by this setup. Based on work done in this field, photographer Alexander Lauterwasser captures imagery of water surfaces set into motion by sound sources ranging from pure sine waves, to music by Ludwig van Beethoven, Karlheinz Stockhausen, electroacousticKymatik(who often record in surround sound ambisonics), and overtone singing. In 2007 Thomas J. Mitchell and his son Stuart told the press they had decoded 'frozen music' based on sculptures in Rosslyn Chapel, in part by using cymatics." can you help me with some of information about combine a emf detector with a robot ? ©2011 Michael Ries, all rights reserved.. Simple theme. Theme images by gaffera. Powered by Blogger.